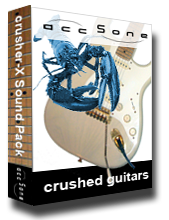 120 excellent designed sounds and effects (crusher-sheets). The ideal starting point for guitarists and sound designers to get deeper in the unlimited world of granular synthesis. The source material for these finest crusher effects could be any kind of electric guitars. But also human voices can be extremely modified and granulized. The effects ranges from smooth doubler effects up to very strange crushed and granulized sounds. A must for advanced sound orientated designers and guitarist!